Once you escape a Murfreesboro Escape Room, unlocking a door will never feel the same again! 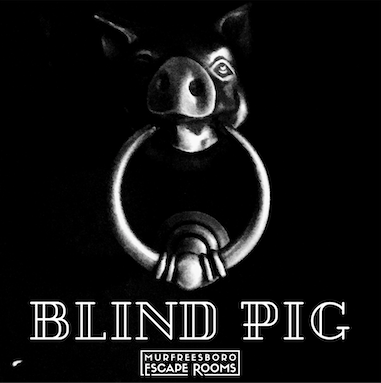 At Murfreesboro Escape Rooms, we build rooms around a story or theme and invite you to test your wits against the challenging clues, perplexing puzzles, and maddening mysteries embedded in the rooms. Be warned, you might get addicted to the thrill of the escape! Your first challenge? Choosing a room. If you've never played before, start with Dinner for Two. If you wanting a fun and meaningful time with a smaller group, play Apartment A. If you're looking for a challenge unlike anything you've ever encountered, try Skinner's Box. If you walk through the alley and wonder what's behind the doors to your left & right, The Blind Pig will satisfy your curiosity. Murfreesboro Escape Rooms is open for bookings daily (see our online booking for specific times). Tickets are available online through our online booking and can be purchased individually or you can reserve an entire room privately for your group. When rooms are available, players can also call in advance to make their bookings. Once you arrive, our room hosts will greet you in the lobby, check your group in, introduce you to the rules of the game, and you will be quickly locked in an escape room with nothing but your wits & team to get you out. Our escape rooms are $26 per person for 60 minutes -- but hopefully you won't need them all. Just know this. We made Murfreesboro Escape Rooms as a place for you to bring friends, family, and coworkers to rise above the usual fare and make something special together -- a great escape. Whoa! Ok. Yes. But what do I do if I still have more questions? You can also feel welcome to contact us at any time and we will answer your queries and get back to you ASAP!